Spring has sprung! The sky is blue and the begonias are blooming. It’s the perfect time to enjoy a day of bargain hunting at your favorite flea market. Decorators everywhere frequent flea markets in search of whimsical collections and cool conversation pieces, and with a keen eye, a bit of negotiating know-how, and a creative touch, you can too! 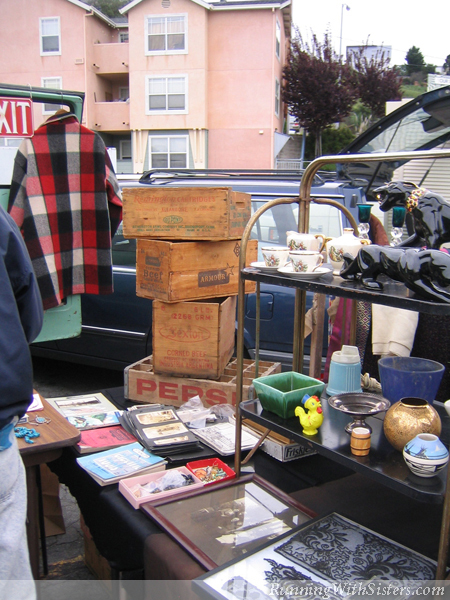 Here are our best tips for shopping the flea market like a pro. To get the most out of your trip to the flea market, it helps to have a mission. A quest will give you somewhere to start and who knows what else you might find along the way! Be sure to pack a snack and bring a tote bag or, better yet, a folding shopping cart (that way you can keep going long after you’ve bought that three-foot wooden Tiki). Stuff your pockets with ones and fives, put on your poker face, and get ready to discover the find of the century. 1. Try not to gasp, squeal, or coo when you see something you love. If you shout, “I can’t believe it! That’s the lamp I’ve been looking for my entire life,” the price just went up. 2. See something you want? Before you ask the price, decide what you’re willing to pay. If you think $15 is okay for that Mr. Peanut doorstop, but think $25 is too much, it makes negotiating a cinch. 3. To get a great price, don’t just ask about the one item you’re after. Start with the Howdy Doody nightlight and the Frito Bandito Pencil Topper before pointing to the fabulous fifties Radar Chair you really want. This approach doesn’t give away which item you can’t live without. 5. Even if there’s a price shown on an item, ask anyway. The $100 tag on that cigar store Indian could be from the vendor’s antique shop. It should fetch a lower price at a flea market. 7. If the asking price is still too rich for your blood, walk away. Oftentimes the vendor will call after you and meet your price. There’s a reason why this is a bargaining mantra, so try it!